The video is of a US police officer's suprise birthday party. WATCH IT, i did not type out the contents here so as to not spoil the suprise... I know im kind, so thank you and please leave comments. It is a short video clip, 39seconds, uploaded to youtube by someone namely ME=). If you DO NOT leave comments, so be it. US polices sure are suprising..
How modern is society?? THIS MODERN! Monks dancing~ OH LOOK! HOW WELL THEY DANCE. Attaining enlightenment by reading online articles i guess. 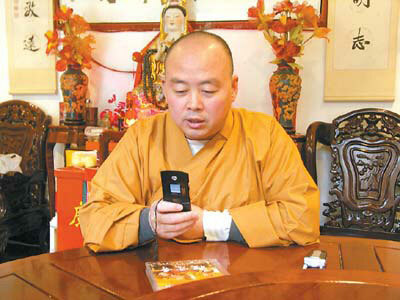 Probably sms'ing fellow monks about scriptures and stuffs. 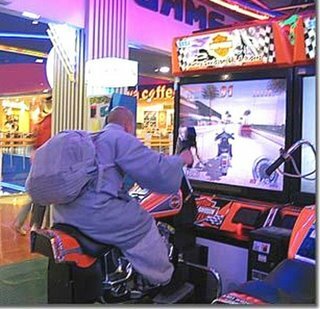 I always thought monks are suppose to restrain from meat, greed, money, etc etc. An they are suppose to be NOT tempted to play arcade(=. 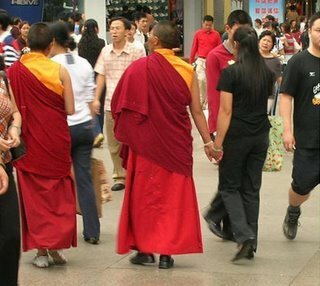 Monks are now spreading influence ONLINE, sign up NOW...! 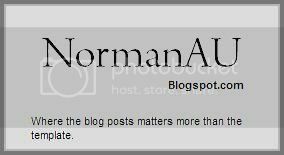 I might be creating a blog which has complete same posts as this blog, however the blog will exclude all unnecessary stuffs EXCEPT blog counter. Thus, that blog will be low-detailed version of this blog, for people who can't take abit of lag... ... or maybe alot.